BACKGROUND : Surgery is the treatment of choice for localized esophageal squamous cell carcinoma (ESCC). Despite curative surgical resection, the majority of patients develop local and systemic recurrence with poor 5-year survival. AIMS : To study the role of low dose continuous infusion (CI) 5-fluorouracil (5-FU) and cisplatin as neoadjuvant chemotherapy in ESCC. SETTINGS AND DESIGN : A non-randomized prospective study conducted over a period of two years (1996-1998) in the Department of Surgery, All India Institute of Medical Sciences, India. MATERIAL AND METHODS : Twenty-two patients with ESCC were included in the study. Chemotherapy consisted of a continuous 30-day infusion of 5-FU (350 mg/m2 /day) and cisplatin (7.5 mg/m2/day), 5 days/week for 4 weeks. All patients had surgery following chemotherapy. 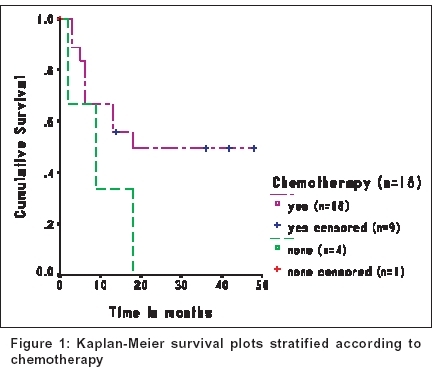 RESULTS : A full course of chemotherapy was completed in 18 patients (82%). Chemotherapy was not completed due to non-compliance (n=2), thrombophlebitis (n=1), and vomiting (n=1). Grade-1 haematological and hepato-toxicity was observed in four patients. Thirteen patients developed thrombophlebitis. After chemotherapy, improvement in dysphagia was observed in 13 of 22 (59%) patients. 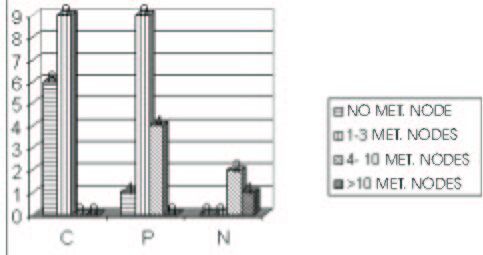 Radiological partial response was observed in 8 patients (36.4%). 19 patients underwent surgical resection (86.4%) with zero mortality. Post-operative morbidity was observed in six patients (27%). Complete and partial pathological response was observed in two (11%) and one patient (5.5%) respectively. The overall median survival was 18 months and 4-year survival was 42%. CONCLUSIONS : Low dose CI 5-FU and cisplatin is well tolerated with minimal toxicity. Histopathological response rates and survival figures are comparable with the more toxic neoadjuvant chemotherapeutic regimens. OBJECTIVES : This study was designed to assess the clinical, sonographic and histopathological response of axillary lymph node metastasis to neoadjuvant chemotherapy in patients with locally advanced breast cancer. MATERIAL AND METHODS : Forty patients with locally advanced breast cancer (LABC) with clinically palpable or sonographically detectable axillary nodes were studied. FNAC of the primary tumor and axillary nodes was done and patients were started on neoadjuvant chemotherapy. Axillary nodes were assessed clinically and sonographically for response after 3 cycles of chemotherapy. All patients underwent total mastectomy with axillary clearance and the lymph nodes in the specimen were examined for metastasis. RESULTS : 47% patients had complete clinical nodal response, while 19% showed complete sonographic response. Complete pathological nodal response was documented in 22% of patients. Ultrasonography was found to be more sensitive than clinical examination in assessing complete nodal response. 10% of the patients had complete pathological response of both primary tumor and axillary nodes. There was significant correlation between pathological response of primary tumor and lymph nodes (P=0.004). Patients with complete sonographic or clinical response were found to have no or minimal residual disease in axilla and hence axillary dissection may be avoided in them. 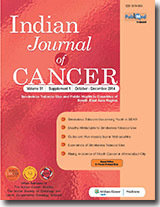 BACKGROUND : To study the external radiotherapy (EXTRT) regression patterns in cancer of the cervix. AIMS : Evaluate EXTRT tumor regression doses (TRD) for 50% (TRD50), 80% response (TRD80), normalized dose response gradient (γ50) and slope (slope50) with clinical outcome. 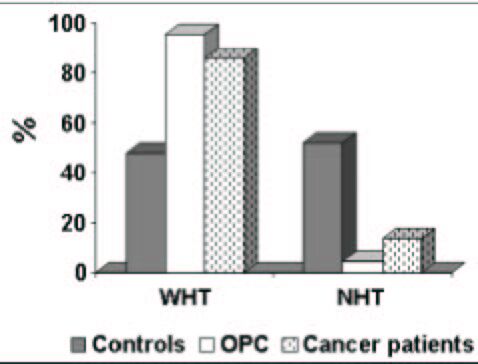 SETTINGS AND DESIGN : Patients, treated solely with radiotherapy and enrolled for other prospective studies having weekly tumor regressions recorded were considered. MATERIAL AND METHODS : Seventy-seven patients received 50Gy of EXTRT at 2 Gy/fraction followed by 18Gy of high-dose rate intracavitary brachytherapy at 6 Gy/fraction. Loco-regional regressions were assessed clinically at weekly intervals during EXTRT to generate EXTRT dose-response curves. STATISTICAL ANALYSIS USED : Student's t test, logistic regression, Kaplan Meier and Cox's proportional hazard model. Scatter plots were fitted using cubic fit. RESULTS : Age (P=0.052) and absence or presence of gross residual tumor (AGRT and PGRT respectively) following EXTRT (P<0.001) were the only determinants for complete response (CR) at 1 month following completion of radiotherapy. EXTRT tumor regression sigmoid curves obtained for various patient characteristics differed only for those with AGRT and PGRT with differences in TRD50, (P<0.001); TRD80 (P<0.001) and slope50 (P=0.001). 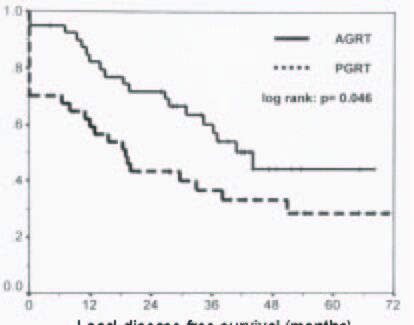 Response status to EXTRT was a prognosticator for loco-regional disease free survival (LDFS) (AGRT vs. PGRT; P=0.046). On multivariate analysis, both TRD50 and TRD80 emerged as significant predictors for tumor status at end of EXTRT while TRD80 was the sole determinant of LDFS. CONCLUSION : Extent of tumor regression to EXTRT is an important predictor for treatment outcome in cancer cervix as evident from TRD50 and TRD80 values of EXTRT tumor regression curves. The main objective was to determine the clinical and radiological features of metanephric neoplasms. The tumors were diagnosed on histopathological examination. The clinical data and imaging features were retrospectively analyzed. Between 1998 and 2003, 3 patients underwent radical nephrectomy for renal masses turning out as metanephric neoplasms on histopathology. Two of these tumors were metanephric adenoma (MA) and one was metanephric adenofibroma (MAF). Clinical and radiological features were reviewed. All patients were adult females who presented with flank pain. Tumor was detected on screening ultrasound as a hyperechoic lesion. 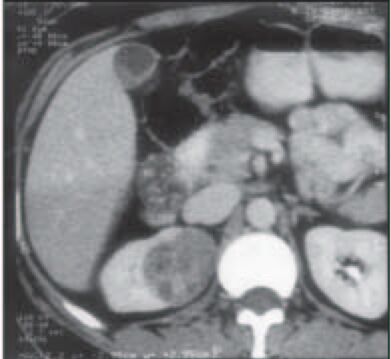 In all cases CT showed a hyper-attenuating exophytic lesion with cystic areas that enhanced with IV contrast. Based on combination of clinical and imaging features it may be possible to prospectively identify metanephric neoplasms and thus avoid unnecessary radical nephrectomy in favor of conservative surgery. Gangliogliomas are rare tumors of the Central Nervous System. Five Gangliogliomas were diagnosed out of 1560 brain tumours surgically resected out in a period of 5years accounting for 0. 32%. We have tried to discuss in detail the pathological features of these tumours and have mentioned the clinical and radiological features associated with them. 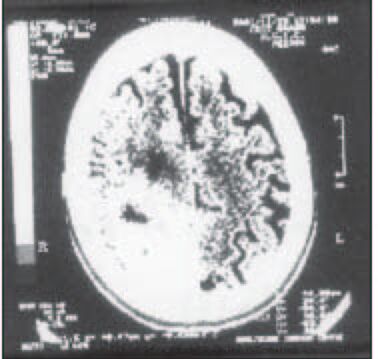 All the slides, tissue blocks and pathology reports of the surgical specimens of gangliglioma were reviewed and the clinical and radiological data reviewed. The ages of the patients ranged from 7 - 65 years with 4 males and 1 female. The tumors were located in the lateral ventricle (a rare site), temporal, parietal and the frontal lobes with duration of seizures varying from 1- 9 years. The tumors were diagnosed by the presence of a dual population of neoplastic ganglionic and glial components. The glial components consisted of pilocytic astrocytes (l case), fibrillary astrocytes (2 cases), oligodendrocytes (1 case) and anaplastic astrocytes and oligodendrocytes (1 case). There was one-grade I GG, three-Grade II GGs and one-grade III GG. Astrocytes were the commonest glial component of GGs, either pilocytic or fibrillary. Oligodendrocytes as the glial component of GGs was seen in 2 cases one of which was anaplastic and this is a rare finding.